A 1939 pamphlet by E.Workman about the Agricultural Workers Organization of the IWW. He maintains that the AWO represented 'class unionism', which was more effective and in the spirit of the IWW's revolutionary aims than industrial unionism. This is the story of the Agricultural Worker* Organization, which was formed in April 1915 and lasted until March 1917 when it was dismembered. The history of this union has up to now remained unrecorded. The present writer now seeks to tell the story of the A.W.O. because he believes that in the record of its existence — the struggle to organize workers on a class union basis — is contained a lesson which is of current importance to the working class. No problem more vitally concerns American workers today than the problem of organization. Up to now, apparently, division has been the cardinal organizing principle of the old-line organizers -and in that category is included the C.l.O. as well as the A.F.L. First the workers, when organized, were separated into craft unions, bickering among themselves, holding to different wage scales and working conditions. Their success lasted only while important sectors of American industry were still in the craft stage. When the building of a stage coach required few separate operations. Requiring only two or three sets of skilled workers, the craft division may have been feasible. Then came the industrial stage. When the chassis was placed on the belt which rolled through the hands of thousands of workers to finally take form as a modern automobile, simple logic made at clear that the workers could serve themselves only if they were organized in one union, irrespective of the particular function of the individual worker. in contradistinction to this affirmation of the importance of class unionism was the provision of the constitution which provided for the industrial union plan. The A.W.O. may be said to have organized on the basis of the Preamble while the I.W.W. organization as a whole was based on the industrial union form. The reasons for the form of organization which the A.W.O. sponsored was not contained in any notion in the heads of its organizers, nor was it based on theoretical abstractions. It was essentially a product of the economic conditions which it faced in the process of development. During the fall and winter of 1910-11 the writer, who was later to become the secretary of the A.W.O., was in Duluth, Minn. Here he had the opportunity to see the Steel Corporation in virtual control of every industry of major importance: mills, mines, lumber camps, railroads, ship were all in the hands of the single monolithic trust. Needless to say the pres also came under the sway of this vast central power. The individual worker was powerless against such a far-reaching monster. Only organized opposition could have any meaning — and this meant not an opposition which was split into forty or more separate industrial unions but & single, powerful, unified organization. A union was needed that would embrace all the workers, irrespective of trade or industry - ONE BIG UNION. Later he was to meet up with the organizing problem in the harvest fields where workers came from a thousand different industries and crafts. It was necessary that they be organized into one union, to effectively maintain working standards and forestall the inevitable competition among workers who are divided. The A.W.O. No. 400, chartered by the I.W.W., sought to do just this. It did not ask the workers who flocked to the fields what industry they represented and parcel them out to the "right" unions. This would have meant disaster. It did not divide the workers when the season's end sent them to the lumber camp, copper mine and railroad shop. It continued to hold them together in one union. Although the A.W.O. 's growth was phenomenal, the I.W.W. Executive Board looked askance at its policy of one big union organization. The I.W.W. still clung to the out-moded industrial division concept which actual conditions were refuting. Thus, despite the crying need for just such an organizing policy as the A.W.O. advocated, the I.W.W. as the parent body dismembered it by March, 1917. reducing it to the status of an industrial union restricted to the agricultural field alone. The A.W.O. was broken up into such pieces as — the Construction Workers' Union, the Miners' Union, the Lumber Workers' Union — what was left was renamed "the Agricultural Workers' Industrial Union". Many unions were thus created out of one, but the strength of the workers had been divided. The lion which is dissected can no longer roar and its claws are harmless. It is important to note that the A.W.O. concerned itself with a base wage. It favored wage-equality for all workers regardless of their function; it saw in the minutely divided wage-scales of the orthodox unions an effort to keep workers separated into wage-castes. The fifty-cents an hour worker is pitted against the worker who gets forty-five cents an hour, while he in turn is divided from the "superior" sixty-cents an hour worker. The A.W.O. tried to do away with this vicious competition. All workers were to receive the union wage. In modern industry the vast majority of workers are equally skilled, being able to shift from one operation to another with comparatively little training. And even assuming the superior skill of certain categories, is that reason enough for a larger income? Are their families possessed of bigger appetites; are they more susceptible to the winter cold? In the case of the sons of the rich who have gone to the universities, it may be asked: Who has in the final sense paid for their training? And has their college education cost them in health and personal happiness any more than the miner's son had to pay working in the mines during the period when the college student spent his time at school? The answers to these questions are self-evident. Finally, assuming it to be desirable, it is today fairly impossible to determine exactly what share each worker has contributed to the finished product. Has the worker who has transported the raw material contributed more or less than the worker who has unloaded it or shaped it? The society of tomorrow will have no need to ask this question. The social producer will share equally in the socially produced product — with adequate provision for the children, the aged, the disabled. The worker engaged in the less favorable occupations will receive his reward not in the form of greater income, but in the form of shorter working hours, increased recreation time, longer vacations. The A.W.O was, in effect, the One Big Union in embryo. Its striking success during its short existence indicates the possibilities in this direction. Tomorrow, the workers will break the organizational bonds which now divide them into a multitude of conflicting organizations which help to support extensive bureaucracies, and build the One Big Union which will recognize the identity of interests among all workers. In this unity lies the hope of civilization. In the struggle for its achievement is contained the fight for social ownership, for workers' control of production and distribution, for economic equality. The A.W.O. was the Agricultural Workers' Organization in the I.W.W., organized during the month of April, 1915. Its membership was composed, in the main, of migratory workers. Their seasonal occupation made it impossible for them to have Unions of a local character; in winter, they were lumber jacks, in spring and summer they were harvest-hands, construction workers, etc., or they worked at any job available. This situation compelled the A.W.O. to organize workers on the basis of their status as workers, instead of organizing them on the basis of their occupation. Many attempts had been made by the I.W.W. at establishing agricultural unions (autonomous local unions) in various states. For example: around Spokane, Yakima. Wenatchee, Wash., such efforts were put forth especially from 1907-1914; around Brawley, Stockton, Sacramento, Fresno and Los Angeles, Calif,; around Sioux City and Des Moines, Ia. from 1915-1914; around Bozeman, Mont. in 1913; around Rochester and Minneapolis, Minn., in 1912-1914; around Aberdeen, S.D.. and Minot, N.D. in 1913 and 1914. In some cases, where the agricultural workers moved with the harvest season, the locals, which were started in one place in the south, would vanish as the harvest-hands moved north. Some of these locals were organized by the very same workers in the south and in the north. By 1914, many members of the I.W.W. became disillusioned with this scheme of organization. So, at the convention held in September, 1914, the problem in the middle west was discussed. A resolution was adopted to sponsor a conference in the spring of the then existing agricultural workers' locals, as well as for a campaign of organizing generally. These problems were discussed at the Conference in Kansas City, Mo., (April 16th, 1915) which thirteen delegates attended. The agricultural workers' Union then being formed was named, by the conference, "Agricultural Workers' Organization". No such name provisions were to be found in the l.W.W. Constitution. According to this constitution: the union would have to be called "The Agricultural Workers' Industrial Union. Surprised at this official baptism, several members were asked for an explanation, — the answer given by the participants was: that the word "UNION" was anathema to many workers; they therefore thought the word "Organization" would be more acceptable. It was to be — we were assured — a Union just the same, regardless of the difference in the word. The conference then proceeded to a series of decisions. Officers were elected for one year, despite the fact that the constitution provided for an election period not exceeding six months. Street speaking (soap-boxing) in the harvest towns was tabooed, in order to avoid free speech fights, and the slogan became: "Get On The Job!" "Never mind the Empty Street Corners. The Means of Life are not made there!" — Then, strangest of all, the conference provided for the disbanding of the A.W.O., in the fall. The members were to be divided among the several old local industrial unions, and the new ones that would or might be organized during the summer. An incidental provision was for a similar division of the union treasury. A secretary was chosen who was 1500 miles away, and who did not know a thing of what had transpired at the conference. A.C. Christ, who was a member of the General Executive Board of the I.W.W., and the official representative of the Board at the conference, wired W. T. Nef at Philadelphia, Pa — "You are elected Secretary-Treasurer of the Agricultural Workers' Organization; will you accept? Wire answer..."
The newly-elected Secretary stopped on his way (from Philadelphia to Kansas City) at Cleveland, O., to look over some supplies, such as organizers' report blanks, credentials, etc., that might be used to good advantage for this new Union. The l.W.W. Publishing Bureau, however, informed him that they had no such material, nor any samples of any kind, but that these could be secured at the General Office of the l.W.W. in Chicago, Ill. Upon arriving at the General Headquarters of the I.W.W. in CHICAGO: he inquired for samples, such as organizers' form blanks, delegates' report blanks, credentials, etc., — all of which might have been used by different unions, in the I.W.W., during the past. He was informed: that the General Office could not supply any, but that the material could be secured from the publishing bureau in CLEVELAND — where he had just left, empty handed! The purpose of securing these supplies was to try to expedite matters in the affairs of the New Organization. Since neither Chicago nor Cleveland had ever printed such needed supplies in the past, it became necessary to make our own, to conform to our set-up. The history of the A.W.O., during the years following, proved our clerical methods were quite efficient. Win. D. Haywood — "What number will we give them?" Elizabeth Service (probably thinking of the "Four Hundred plutocrats, at the time?) — "How about "400"? It will be catchy, and can easily be remembered, — by remembering the "Four Hundred of New York" and she added "It would be just like the highbrows..."
(Haywood) — "All right. We will make it the Agricultural "Workers' Organization, Number Four Hundred, of the I.W.W." Anybody can see here the official indifference that met this proposed New Union. No one had real confidence in it, nor took the conference decisions seriously. Were there not two rules out of harmony with the constitution? Namely, the election (for one year) of officers, and the name of the new Union? Besides, the elected secretary was NOT to be given credentials. These unorthodox methods became a source of controversy In the I.W.W., inside of a year. The strength of the I.W.W., as a whole, had dwindled to less than 2500 members throughout the United States and Canada. This despite the many successful strikes, in Montana, 1910-11: the Pressed Steel Car Strike at McKees Rocks, Pa, 1909; the lumber strikes in the northwest, the great Lawrence strike of January 1912; the silk strike, Paterson N.J. in 1912; etc. The contrast between gain and loss was, however, glaring. Membership was continually depleting, — yet the Southern Timber Workers joined the I.W.W. in the fall of 1912; as well as the Marine Firemen's Union of the Atlantic Coast, in the spring of 1913. The Phila., Pa, longshoremen, who organized on May 15, 1913, also came into the I.W.W. During the ensuing year this last-named Union had more members than all the rest of the unions in the I.W.W. combined, — it is necessary to mention this, in passing, so that the reader may have a correct perspective of the condition of the I.W.W. as a whole. While the Secretary was on his way to Kansas City (April, 1915), B.H. Williams, then Editor of Solidarity informed him that he did not know whether there would be any further issues of that paper forthcoming. In Chicago, the General Office was extremely hard-pressed for funds. Upon arriving in Kansas City, May 6th, to take office, the Secretary of the New Union found Bedlam run riot! Several members of the I.W.W. actually threatened: they would go out into the harvest fields and wreck, this proposed New Union! I.W.W. members complained that the initiation fee of $2.00 was against the principles of the I.W.W. , — and more in keeping with the A.F. of L. initiation system! — However: the constitution of the I.W.W. actually provided for any charge up to five dollars. Another source of mutiny was that the term of office (for officers) of One Year was too long, gave too much power and centralized control to the officials. The secretary also found not a penny on hand, — nor any membership. Three organization committee members were soap-boxing at Tulsa, Okla., (an oil-field territory). One member was in Sioux City, the other in Des Moines, IA. NO dues nor initiation payments had been collected thus far by this new union, striving to get beyond its mere planning stage. An organization committee meeting was called for May 20th. to which workers willing to help bring about an organization were invited. This meeting in effect, became a second conference. For the whole mouth of May only ONE new member was initiated into the A.W.O., but a few members of the I.W.W. paid up their cards into this new organization, — and such were the auspices under which the Union was born! At the meeting held on May 20th, the A.W.O. Secretary proposed to grant a commission of One Dollar to voluntary organizers and delegates for each New Member brought into the organization. After a lengthy discussion this commission basis was accepted, but the amount of the commission was reduced to 50 cents. Having accepted this method of organizing, it now became possible to issue credentials to every member willing to act as delegate or voluntary organizer. This was a departure from any accepted practice of organizing (in the I.W.W.). Whether this practice was good or bad at the time may be judged by the results that were to be achieved! The worker, reading these lines, might suppose all too readily that this form of organizing would be grasped at by the officials of the I.W.W. The contrary, however, was the case! The old-time organizers lost the monopoly to their jobs; NO election was needed to act as voluntary delegate to get new members, and collect dues on the job; nor had one to be a speaker, strike-leader, personally popular, or a friend of an official. The departure, as related, was against the personal interests of the would-be Labor Saviours! There was the danger that the workers in this manner could do their own organizing, — and thereby the 'Leaders" would lose their importance! From the very start, the A.W.O. had a new problem to face, that had confronted no other union (agricultural) in the I.W.W. before. The United States Government established a Federal Employment Office Service, in 1915, with offices in several cities, one of which was placed in Kansas City, Mo. This office was to take care of Oklahoma, Nebraska, Missouri and adjacent territory, to supply the labor demands in agriculture; it encouraged advertisements for harvest workers in practically all of the large metropolitan Dailies in the east. — featuring screaming headlines calling for 25.000 to 40,000 harvest hands as being needed in Kansas, Nebraska, Oklahoma, etc. — and at the same time there were tens of thousands of willing workers roaming these very states, in search of jobs! It was at one time estimated that EIGHTY-THOUSAND workers were stranded in Kansas, — yet the Eastern Dailies continued their blaring calls for greater and greater supplies of man-power! Several members of the A.W.O. wanted to ask for $7.00 for separator men, $6.00 for engineers on threshing machines, $5.00 for firemen, $4.00 for spike pitchers, and $3.00 for the rest of the harvest workers who were the great majority. Because the workers were so used to having such large differences in their wages, they believed it necessary to continue this practice, to attract the better-paid workers to join the A.W.O. The bosses always paid a few workers well — so that they, in turn, would help to "drive" the great majority! After considerable discussion, the single minimum rate carried the day, and was given a trial in the early summer of 1915. (NO rates were set for the Mechanics.) This was continued in 1916. It was followed by some other unions of the l.W.W. in 1917, and thereafter. Raising the social and economic level of the hardest driven workers was our first need. To reduce the great inequalities among workers was essential to a better harmony and better understanding, in our judgment. The l.W.W. had criticized the Trade Unions up to this day for looking out for the few only, rather than the many. If that criticism was in order: then raising the lowest-paid workers is one of the most fundamental steps that can be made by a workers' Organization. In June 1915 the A.W.O. secured eleven new members, and 135 more in July. Former members of the l.W.W. paid up their cards to this new Union-in-the*making. Now the first REAL organization meeting took place: it lasted for two whole days, July 30th and 31st. It was held at Kansas City, and its main objective was to map out a program for the Northern Harvest, intending to demand fifty cents a day more or $3.50 per day. This was, in the end, dropped; since members thought "they would be unable to make it sack because they did not yet have strength enough. However, it was agreed that more pay was to be demanded whenever such demand could be insured upon — and won; — but AT NO TIME to hold out to the BITTER END; rather to get other members of the union on the "struck" job, in order to strike again, or to slow up production until Mr. Farmer was willing to comply with the demand. This policy was, in fact, consistently followed by this Union. The Great Northern and the Northern Pacific Railroads, as well as other roads, were shipping workers into the Dakotas, free fare, to work at wages of $2.25 and $2.75 per day, in an effort to flood the country with workers and in order to depress wages as low as possible. This took place in August and September, 1915; — so the "Moonlight Bills" could get "cheap labor"! Yet. despite this obstacle, the A.W.O. No. 400 was able lo get $3.00 per day, generally, and in some cases $3.50 as a minimum. This new Union differed yet in another respect from any other union in the I.W..W. The A.W.O. made only a minimum demand of wages, and that for the lowest-paid workers. This was a complete change. This policy was followed because the majority of workers were the lowest paid. The A.W.O. did this from the very start. — and never changed that policy, — its principle was to raise the economic and social level of the lowest-paid workers to that of their better-paid fellows, — to push forward together. But, in order to effect this "push" ALL available labor supply MUST be organized into ONE and The Same Union. By the end of October 1915, we had about two thousand members: three hundred were initiated in August; six hundred and one in September, and seven hundred and seventy-five in October. Former members of the I.W.W. paid up their cards; among them were miners, harvest workers, lumberjacks, railroad men, construction workers, and even some cotton pickers in southern Louisiana. It was a union born out of the chaos of workers divided by craft and industries; the spectacle was amazing, — but it was real. Many of the better-paid workers also joined it, to help bring about ONE Union. In view of this decision, we sent an organizer (in February and March, 1916) through the Iron and Mesaba range. Many miners work in lumber camps, part of the year; and, in season, in the agriculture section. Organizers were placed in the lumber regions at Bemidgi and International Falls, Minn.. Ashland. Wis., St, Maries, Idaho, etc. An average of one hundred new members a month were added to the A.W. O. during the winter of 1915-16. WHAT EFFECT DID WE HAVE IN THE LUMBER BELT? The I.W.W. provided for a Free Transfer from one union to any other within the I.W.W. The A.W.O. secretary, however, made an open appeal in December 1915 to its membership: to keep together over the winter, in order to have a strong union to start with, the second year. This at once brought bitter resentment on the part of several small Locals who were calling for members from the A.W.O., — they were quite unconcerned whether this would sap the strength of the A.W.O. No. 400...On this question several articles and editorials were written in the official I.W.W. papers, during the winter of 1915-16. These editorials were directed against the A.W.O. for endeavoring to organize where other unions of the I.W.W. "might" organize...This propaganda continued all through the summer of 1916. "A.W.O. CALLED A MULLIGAN STEW"
The A.W.O. was called "a Mass Union" — a "Hobo Union" — a "Migratory Workers' Union" — a "Great Big Mixed Local" — facetiously or viciously so, according to the disposition of the caller. — a "Mulligan Stew" . But never was at called a WAGE WORKERS' Union, — which is exactly what it was! A couple of small paper locals of the I.W.W, joined up with it. The A.W.O. became THE I.W.W. Union of the middle west; it established offices in several states. As a direct result of the organizing drive of the A.W.O. around Duluth, in the lumber camps, and among the miners, the Mesaba Range strike broke out in June 1916, with demands for $3.00 for an 8-hour-day as a minimum. The A.W.O. organized the miners, and supported that strike to its utmost. But, as the A.W.O. became bigger and bigger, the attacks on this union by the orthodox industrial unionists became more pronounced. The A.W.O. did not need a transfer within its organization of, say, from mine to farm, or from lumber camp to construction job, or from Milwaukee to the Cascades, — and much of the "office work" was thereby eliminated. Would-be functionaries saw in this their elimination, since jurisdictions were thus disregarded or obliterated. The final cry broke out — to start other unions! "The A.W.O. is swallowing up everything!" Yet we were all members of the I.W.W. The A.W.O. No. 400 proposed to members of the I.W.W., in California, who were working mostly in agriculture: to become a part of it, and to establish a Branch Office there. This proposal was rejected, — and C.L. Lambert answered with acrimony "that they knew how to organize, and did not need our help or advice"...Thereafter, they called for a conference among: themselves, and applied for a separate charter, in February 1916 this Union was chartered as the "Agriculture Workers Organization Number 440" of the I.W.W. (But why not INDUSTRIAL Union, to be "constitutional"? Later, they called themselves "the A.W.O. of California". This union had, however, only a brief life of a few months. Localism and sectarianism crushed them. A Lead Miners Industrial Union was also chartered by the I.W.W. for Webb City, Mo., in January 1916, out of members of the A.W.O. No. 400. These workers were mainly migratory workers, intending to work only temporarily in the mines, until the harvest would start again, in the spring. (Could not this have been a motive to make an outlet for would-be-officials?) The Unions lasted about three months. It received some help from the A.W.O., and the General Office of the I.W.W. but, despite all, it could not make things go. Sectarianism was against them. The May Meeting of 1916, in Kansas City, increased the wage demand to $3.50 per day as a minimum, with corresponding improvements in conditions. Four dollars was first proposed, but $3.50 was finally adopted, after serious consideration of the possibility that we would have most members off the job, on that issue. However, it was understood that $4.00 would be carried through if sufficient strength could be developed. By the end of 1916, the A.W.O. No. 400 had enrolled nearly twenty thousand workers. It had improved working conditions on a scale far beyond the limits of its organization. Workers of all denominations began to come in, by the hundreds, every week. The May meeting of 1916 (Kansas City) again had all officials up for election; new officials were elected, only the secretary was re-elected; "rules" could not shackle the wishes of the A.W.O. No 400. But, the little divisions started could not make the grade! The A.W.O. began to fight back: it pointed to the necessity of revising the constitution, to damn that section of it which interfered with class organization. It fought against the disintegrating effects of localism. The official press of the l.W.W. stated and restated: that the A.W.O. was illegal, was outside of the constitution...The press, however, could never state that the A.W.O. was outside of the scope of the preamble of the I.W.W. The l.W.W. convention of 1916 was held in the latter part of November. At this convention the A.W.O. No. 400 had three or four times the voting strength of all the rest of the I.W.W. unions combined; (seven delegates with 36 votes each — 252 votes altogether). We would have been able to make all changes that we deemed necessary. The proposed changes were naturally adopted. But the most we were interested in was to bring the A.W.O. form within the l.W.W. constitutionality: to cut out the asinine propaganda and the continual harping: that the A.W.O. was illegal. Here, then, we had a struggle to legalize a union-form that sprang up out of conditions which were not calculated nor invented by some intellectual. It is necessary to point out that we organized in the right form unconsciously and were not determined, therefore, that it should continue so. About the 10th of December, 1916, while the former secretary of the A.W.O. was still in Chicago, he was requested to attend a general executive board meeting 6f the I.W.W.. at which all members of the board were present, including the General Sec'y-Treas., who was also a board member. Here he was informed that he was to be appointed Sec'y- Treas. for a Lumber Workers' Industrial Union (No. 500), which the board decided to charter with an office in Chicago, III. This union was concocted in the general office, by the G.E.B. The secretary was dumbfounded: never had he heard of the G.ELB. of the l.W.W. setting-up Unions in such a way— and appointing officials for them! In the past, members of a union, or a union to be, always elected their own officers. Yet this very board was constituted of members of the I.W.W. — who were loud in shouting "rank and file control!" The former A.W.O. secretary stated at this board meeting: that there never was as much as a single Letter or request from the lumber workers in the A.W.O. for a SEPARATE UNION — yet there "were about two thousand lumber workers in the A.W.O. No. 400. W. D. Haywood, present at the time, became peeved at this "insolence". The former secretary of the A.W.O., continuing, said that IF a separate lumber workers' union were needed: it should be very closely knit with the affairs of the A.W.O. No. 400. This drew the following extension from Haywood: "Damn that A.W.O.! It's setting too damned strong!" He cooled down, somewhat, then explained, somewhat patiently, to the A.W.O. secretary: You see: what WE have to do is to start these industrial unions, so we can 'balance' one against the other, so we can control them!"... However revealing these words may be of the psychology of the man then "on top", they were uttered quite frankly and simply) Pit one against the other!...What for?...For whom ? . . .
After considerable discussion, the former A.W.O. secretary consented to help establish such a union, — but first he wanted to solicit the membership of lumber workers in the A.W.O,, and the remaining lumber worker locals on the West Coast: IF THEY WANTED such a separate union. As the place for the office: the former A.W.O. secretary wanted Minneapolis, (Haywood wanted Chicago) and there the matter rested; he knew then and there that he would never be consulted any further on this matter. A miners' union (No. 800) was also instituted by that board, one Grover Perry, a personal friend of Haywood, was "appointed" as Secretary-Treasurer. Perry had been a street-car man in Cleveland and Chicago for several years. This, too, was all effected without consulting the respective Miners' Unions still in existence, or any members of the l.W.W. who were miners in Butte and on the Mesaba Range, etc... MORE "rank and file control !". . , Haywood "explained", at this board meeting, again with characteristic frankness "that Perry worked only part of the time and was therefore in need of a job" . . . Friends must be "taken care of" — one in thus let to suppose? WHY all those unions — in a single industry sponsored by an organization whose principal slogan wasn "ONE BIG UNION" WHY, if not for the purpose of creating more "jobs", and more officials! Furthermore, how can this motive for dividing be distinguished from that of the "reactionary" craft unions? "The working class and the capitalist class have, — indeed! nothing in common!" But was it not here demonstrated that "job aspirants" HAVE something an common quite exclusive from the interests of either class? On January 1, 1917, the former A.W.O. secretary arrived in New York — a stranger — like an intruder- no one knew anything of his coming, or had been, advised of it. Within about three months we had members of two Unions on board of ships, and delegates from both, since ships go back and forth from the Atlantic and Pacific Coasts. Each delegate tried to prove that the union HE represented was the better union, and the worker came under his union's jurisdiction. THAT was what "industrial unionism" had come to: Bureaucracy at the top — division at the bottom! There was a constitution, there was a preamble, there were all the current revolutionary slogans, but they might as well have been thrown overboard. The expediency of the moment determined everything, and that expediency, — it cannot be too strongly reiterated:was motivated by the interests of a "superior minority" with which every labor organization has been hitherto afflicted! The preamble of the I.W.W, clearly and specifically calls for "defense of class interests", — but the industrial unions are based on sectional or group interests! Herein lies the contradiction of the preamble — against that of the constitution; therefore such unions could be conceived as above instituted. The reader may ask: WHY did YOU let the G.E.B. divide the A.W.O into practically Four Parts? YOU HAD the voting strength, at the I.W.W Convention in November 1916, — why didn't you STOP the splitting, and do what you wanted? The answer is: we firmly believed that the industrial unions within the I.W.W. COULD NOT conceivably become involved in jurisdictional disputes. Besides, who could have foreseen or imagined: if he did not experience the things that transpired, that the G.E.B. 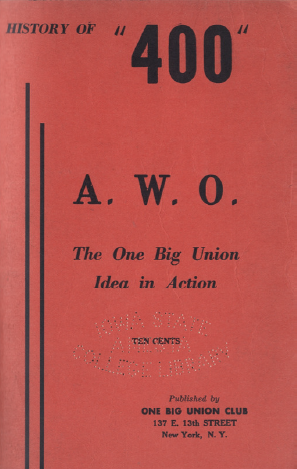 would set up unions to rival the A.W.O., an integral affiliate union in the I.W.W. Pitting one against the other is the principle of "DIVIDE AND RULE!" It is the age-old scheme of politicians! The A.W.O. was unquestionably lining up on the basis of the second paragraph of the preamble: by organizing ALL workers into ONE union; but since, in contradiction to this, we accepted the MANY industrial unions as being ONE union; therefore we allowed the industrial union demarcations and jurisdictions to be preserved. The A.W.O. office served, primarily, as an information center to disseminate all job information, good or bad; so that the membership could act accordingly on its own initiative. The union office was thereby only an organizing force and a center of information. A Union is NOT organized for the purpose of becoming a warring faction against another union, — but to become an effective instrument by which the workers may better their conditions. It is NOT organized to he dominated by a small minority who may wax fat as "salary drawers". Politicians are but bosses in disguises! They are New Rulers, regardless of the slogans they put forth or the high-sounding phrases they may use. Either the clause in the preamble "The workers must organize an a Class!" to emancipate themselves, HAS a meaning and must be taken seriously, or it is utterly worthless and belongs in the ash-can! ONE UNION — a class union — is in line with the preamble, and the need of the day, in order to bring about security and economic equality for all! This may not be easy to achieve. In the path of realizing full economic equality, of production for USE, stands the Capitalist system. But, from the day when workers organize as workers into a CLASS organization, from that day onward they will march toward their own emancipation. New methods of organization must replace the old. New slogans, new standards, must be raised; the goal is workers' control of production and distribution — and this goal can be realized only when the workers rely upon themselves, and upon no one else! Wherever you are: struggle for the CLASS UNION, with CLASS aims rather than for industrial unions with sectional aims. Practice equality to the utmost now, and you will achieve solidarity there-by. DO these things, and you will improve your condition and be on the road to a better world to live in! Join the One Big Union Club and help advocate the One Union Idea more effectively. Yeah, I saw that on Crutchfield's site, but wanted to dig more before using that uncited claim. Very interesting pamphlet also published by the "One Big Union Club".